While Fantastical 2.10 doesn't offer shortcuts to create new events or reminders in the background based on text from the clipboard1, it features a good selection of shortcuts to view lists of items from the app as well as launch specific screens. My most used one so far is the 'Schedule for Today' shortcut: when invoked via a Siri phrase, it loads a Fantastical snippet that aggregates calendar events and reminders due on the current day; each item features a date and custom color to indicate the list it belongs to. The same shortcut also exists in a 'Tomorrow' flavor that I've found quite handy to get an instant preview of what's coming up in my calendar app and task manager. Fantastical's native shortcuts in iOS 12. 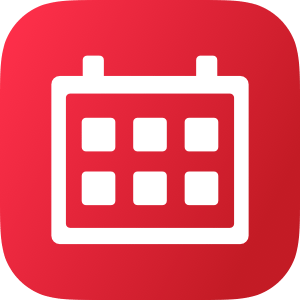 In addition to shortcuts that aggregate items from multiple lists, Fantastical now features shortcuts to view events or reminders from individual calendars or Reminders lists too. 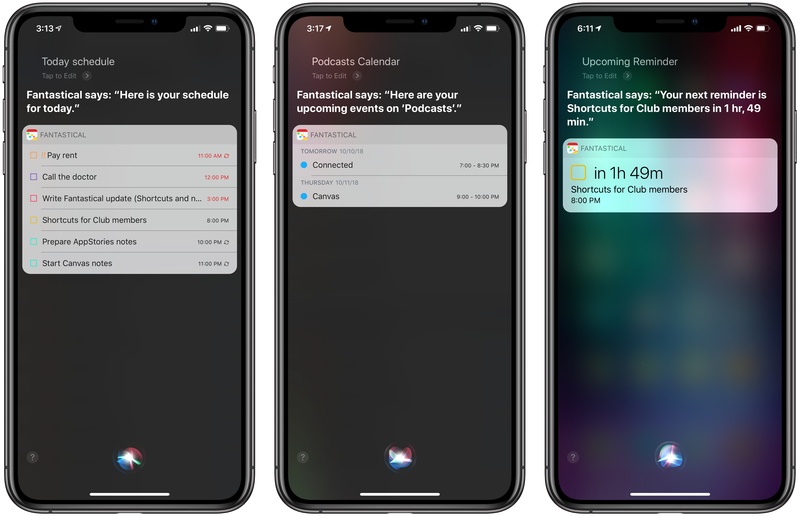 These suggested shortcuts are automatically created for each calendar or list you have on your iOS device, and they can be found in Settings ⇾ Fantastical ⇾ Siri & Search ⇾ Shortcuts. I've added a couple of these to check on calendars and lists that I frequently use, and I like how events and reminders are grouped by day in the visual intent that is loaded in Siri or the Shortcuts app. I've also assigned a "type event" Siri phrase to a shortcut that launches Fantastical in the reminder/event creation screen, which is useful when I want to quickly add an appointment via natural language. As was the case with Things' update for iOS 12, even though I like what Flexibits has done with shortcuts in Fantastical, the fact that the app isn't Universal diminishes their impact for someone who works on both an iPad and iPhone every day. A Siri phrase assigned to an app shortcut can work on every iOS device only if the app it's associated with is Universal and installed on multiple devices at once. In their current version, Fantastical shortcuts you've set up on the iPhone won't work on the iPad and vice versa; you'll have to assign a Siri phrase to the same shortcut on each device, and of course your phrases will have to be slightly different otherwise iOS 12 won't let you save them. You can build custom shortcuts to work around the issue of separate app shortcuts for non-Universal iOS apps. This hasn't turned out to be an issue for me because I tend to use Fantastical more on the iPhone anyway, but it's worth noting for those who may want to use Siri phrases for Fantastical everywhere. A possible workaround, which you can download below, is to create a custom shortcut that loads a Fantastical shortcut in either its iPhone or iPad version depending on the device you're using. Doing this will add a step to execution within Siri, but it's a possible solution (which you can reuse for apps that still offer separate iPhone and iPad versions). 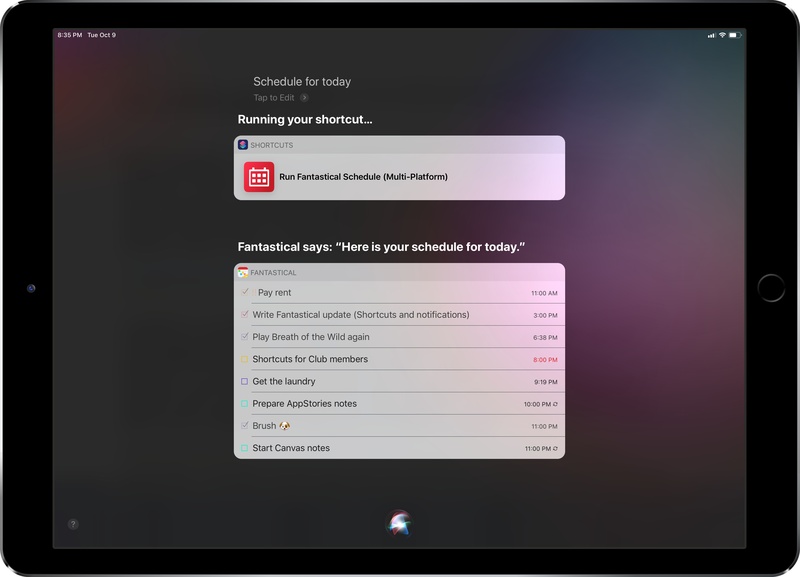 View Fantastical's schedule for today using native app shortcuts for the iPhone and iPad versions of the app. The shortcut doesn't require any user interaction to choose platforms. Fantastical 2.10 has also brought buttons to snooze events and reminders directly from notifications. These buttons can snooze alert times (they won't change the due date itself) for 5, 15, or 60 minutes, and they're available by expanding a Fantastical notification both on iOS and watchOS. When a reminder is snoozed, it keeps its overdue status, but an alert for it will re-appear when the snoozed time expires. Snoozing alerts with Fantastical for iPhone. 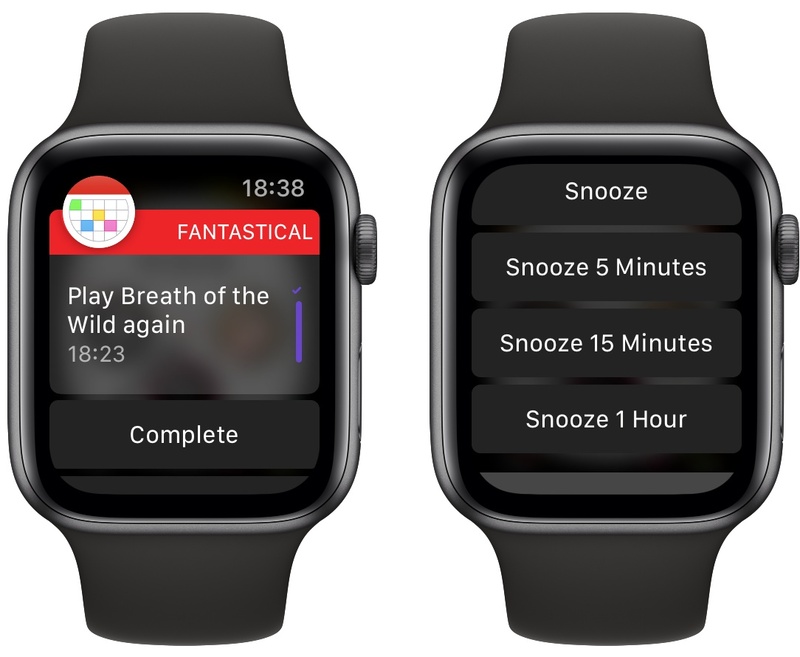 Snoozing alerts with Fantastical for watchOS. Apple Watch Notification Center: Reminders, grouped. My notification settings for Fantastical (left) and Reminders. My reasoning is simple: when I'm not using my iPhone, the easiest way to snooze a reminder is to expand the notification on the Watch, which means I can send Reminders' own alerts to Notification Center. If I'm using my iPhone, I want Fantastical's notifications to be the only ones I see when I'm in an app; and because I still want to have Reminders' notifications on the lock screen, I chose to send Fantastical's directly to iOS' Notification Center. This dual setup allows me to use Fantastical almost like some people use Due; I would love to have per-list custom notification settings (so that only certain reminders fire off notifications that contain custom snooze times), but I'm probably asking too much. Finally, I want to mention Fantastical's integration with the new Infograph faces on the Apple Watch Series 4. 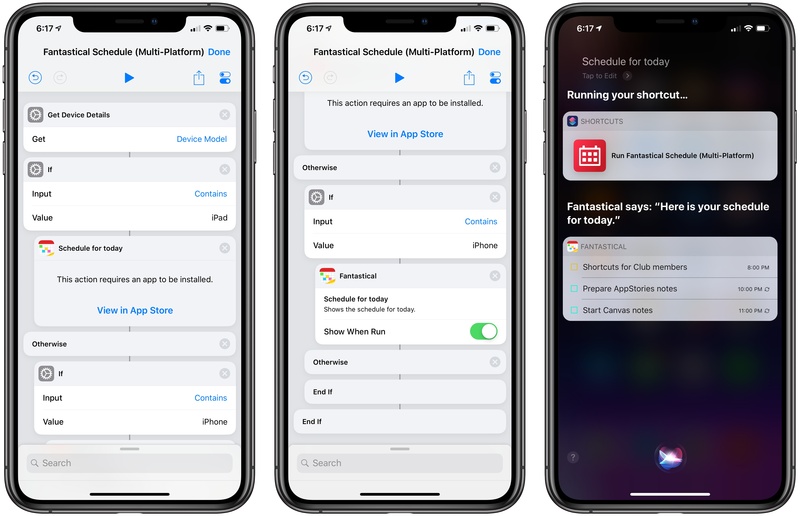 By opening Fantastical's own Settings and navigating to Apple Watch ⇾ Complications, you'll be able to configure Fantastical's complications for both small and large layouts. These include the new Graphic Circular, Corner, Bezel, and Rectangular complications that can be added to the Infograph and Infograph Modular faces on the Apple Watch Series 4. Fantastical's complications for the Infograph and Siri watch faces. In customizing the Infograph watch face to my needs, I realized that I wanted to display the digital clock at the top and see the current date in the bottom left corner. Surprisingly, Apple still offers an inconsistent set of complications for system features on watchOS, and I couldn't find a basic Date complication that I could put in the lower left corner of the Infograph face. Some folks on Twitter recommended Better Day, which is an excellent utility to create a variety of date-based complications for every watch face and customize every aspect of them. I used Better Day for a while, and it worked well. However, the latest version of Fantastical can also display the current date and day of the week with a Graphic Corner complication, which allowed me to delete Better Day and just use Fantastical. In future updates to watchOS 5, I'd like Apple to bring more consistency to their complication offerings; every built-in app or system feature should offer at least one complication for every available type. Even though I'm a fan of Fantastical, I shouldn't have to use a third-party complication to see the current date in a specific corner of the watch face I prefer. 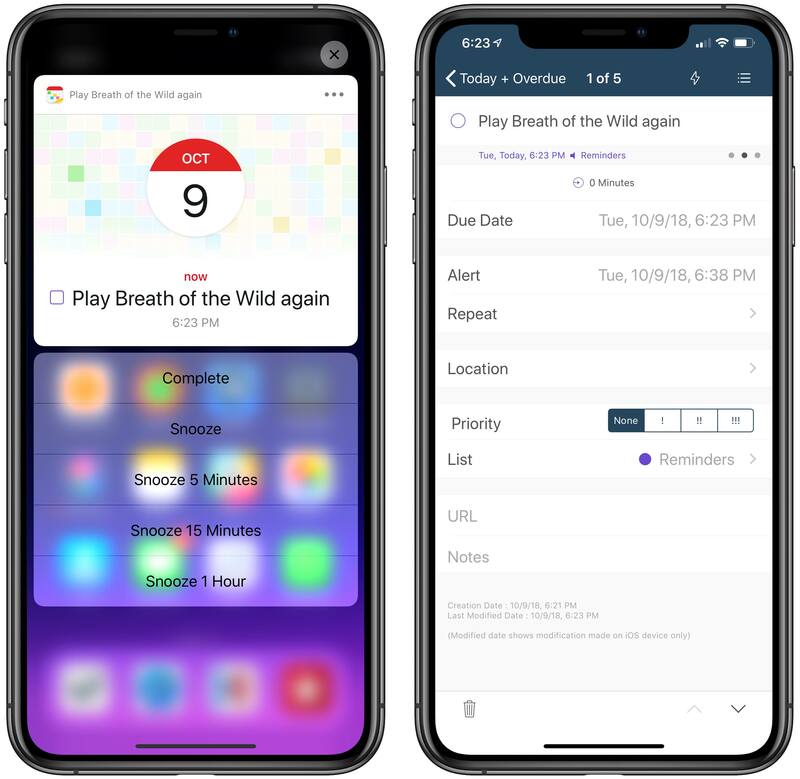 One of the most compelling aspects of using Reminders as a task manager is having the freedom to mix and match clients for different features and integrations. Just like I can connect the same email account to different email clients, with Reminders I can use a combination of GoodTask, Apple's Reminders app, Shortcuts, Drafts, Siri, and Fantastical to create and manage tasks in the same system. Fantastical's adoption of iOS 12 and watchOS 5 made me appreciate the quality of its overall experience again; if you haven't played with Fantastical in a while, or if you still haven't checked out its shortcuts, complications, and snoozed alerts, now's a great time to take it for another spin. Fantastical 2.10 is available on the App Store for iPhone and iPad.